Though the pre-dawn clouds thickened and at times, the rain fell down with a steady pace, Anna and Gary wanted to move forward with their engagement photos. And boy did we get lucky. 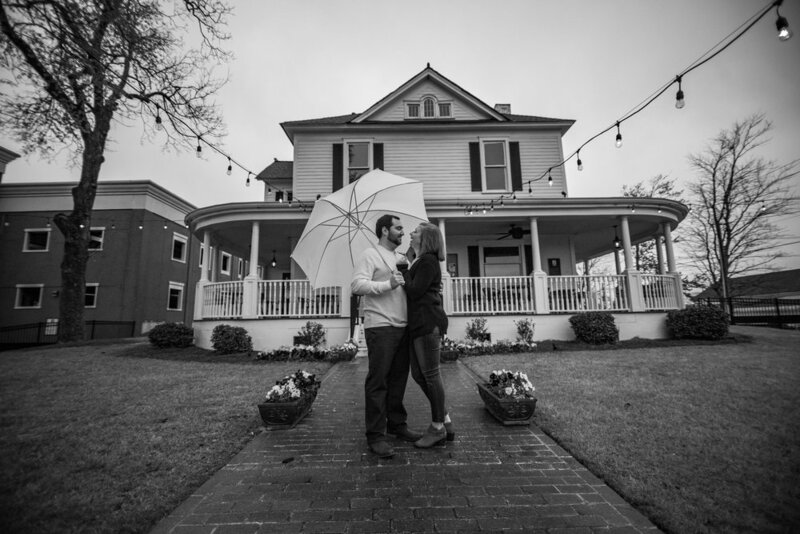 With an umbrella in tow, we met the couple at the Gwinnett Historic Courthouse in Lawrenceville, which was built in 1885, and is located in the heart of downtown. Its “unique architectural features include the original turret (balcony) and clock tower, chandelier lighting, 24-foot ceilings, wood-carved moldings, wainscoting, Palladian windows, faux fireplaces and an outdoor gazebo on a meticulously manicured lawn.” We used back flash lighting and an umbrella to capture some gorgeous blue hour shots with the courthouse as a dramatic backdrop. Despite the gloomy early morning weather, Anna and Gary couldn’t have better sports. In fact, they embraced Mother Nature and her elements. The couple even tracked the rain showers and wind gusts and planned accordingly, which worked to our advantage. As we’ve mentioned in a previous blog, sometimes, things happen that are out of our control, including unpredictable weather. Planning ahead is imperative when it comes to engagement photos, but nevertheless, always expect the unexpected. The meteorologist may call for a slight chance of precipitation, but bring a raincoat or umbrella just in case and use the protective rain gear in your shots. Anna and Gary certainly did. Towards the end of the shoot, the two incorporated their adorable adopted pupper, Jo Jo, into some of their photos. She was a sweetheart. Congratulations to Anna and Gary.